A comfortable home to come to after a fun filled day of hard skiing. Kick off your boots, warm your feet in front of the fire, have a few people over and head out for a night in the Town of Breckenridge. Shuttles stop in front of the building for other ski resorts is the area such as Keystone, Copper Mountain and Vail/Beaver Creek. Rated as one of the best ski and snowboarding resorts in the world with 146 trails on 2,208 acres/894 hectares. An enchanting mountain, with a history dating well over 100 years, cozy Victorian homes and thousands of twinkling lights reflecting in the greatest snow fall in many years. There are miles and miles of groomed cross-country ski trails with scenic mountain views of Ten-Mile Range or take off on a pair of snowshoes and picnic out in the open warmth of the bright sunshine. 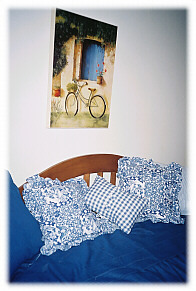 All bedrooms have brand new beds. The king sized beds can also convert to two twins. The first bedroom has a queen bed, attached private bath with a shower on the second level for quiet and privacy. The second bedroom has an a king or two twins, attached full bath, a TV, an office space and executive chair and has an additional phone line for the Internet. The third bedroom has a king or two twins, a TV, Nintendo unit and VCR, a full bath off the hall way. No one has to sleep in the living room on a sofa bed. Every bedroom has its own private bathroom. 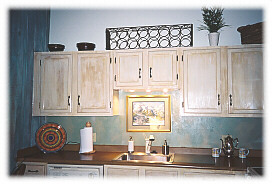 The kitchen is fully equipped including white and red wine glasses and glasses for champaign, Italian dinnerware, crock pot, coffee grinder, toaster oven, waffle iron - everything that feels like home. 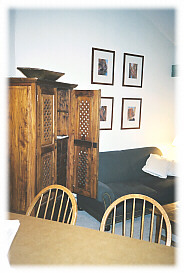 The second level has a small den type area with a professional soccer table. The vaulted ceilings provide a spacious feel as well as offering numerous spaces for local art work. There is a heated garage directly under the building with space for one car per unit. Other amenities not listed above: The living room has a DVD and VCR player, stylized chess/checker set, cards, games and children’s toys. The shuttle to the slopes and other major ski resorts, stops directly in front of the building. The indoor and outdoor ice skating rink is two blocks away. 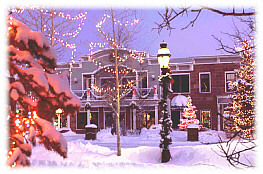 The heart of the Breckenridge village is two blocks away. The Breckenridge Recreation Center is a 5 minute ride with indoor tennis courts, weight rooms over looking the mountains, huge swimming pool and slides, yoga, aerobics, saunas, basketball courts, climbing wall, etc. 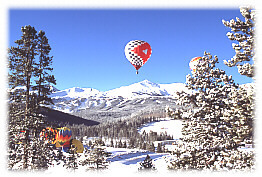 Next door is one of the main parks in Breckenridge with one of the best known sledding hills in the area. 13th Annual International Snow Sculpting with teams from as far away as Morocco, Belize, Japan and Scandinavia. These teams build mammoth works of art from 12 feet tall with 20-ton blocks of snow. Jan. 28 through Feb 2.